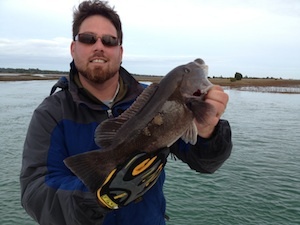 The Wrightsville Beach Fishery is still active and lots of Fun; however, you need to target what’s biting! Water temp is between 55 and 56 degrees and the Red Drum are catchable in the surf between Crystal Pier and the WB Jetty by fishing the sloughs. They are hitting cut mullet and Jigs. The outside of the Jetty is still producing good numbers of Sheepshead and Tautog (both very good eating) using cut shrimp. Find out more about ProFishCNC Charters! Check out our Charter Boat, Fishing Charter Rates, and Wrightsville Beach Fishing Charter Charters. 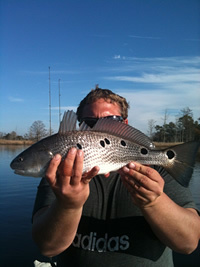 This entry was posted in Fishing Reports Dec 2012 on January 17, 2013 by admin. Wrightsville Beach Water Temp is holding in the upper 50’s allowing for the Tautog (a fish native to the colder waters of the Northeast) to make their way into our Coastal NC waters. They are a great fight and an ever better eating fish! The Speckled Trout are still around and are very big right now (averaging 3 – 4 pounds). Floating Live Shrimp and casting soft baits is the key right now. The Sheepshead are holding on the rocks and pilings right now and are feeding heavy (they eat a lot prior to winter!). Late fall is time to get out and Fish!! Find out more about ProFishCNC Charters! Check out our Charter Boat, Charter Captain, and Wrightsville Beach Fishing Charter Rates. 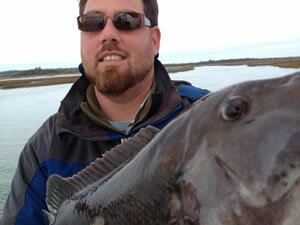 This entry was posted in Fishing Reports Dec 2012 on January 15, 2013 by admin.